Keeping the status quo is a weak motivation.How are they supposed to do that? Either they’re trying to get rid of somebody threatening the status quo or trying to strengthen an institution that supports the status quo, both of which are ins for PCs. Unless the status quo is all hookers and blow, of course. In semi-related news, I had a discussion about how to run a sandbox for RuneQuest over on Story Games, so I’ll post a link here for the sake of posterity, for when I want to go back to it. Exactly! You’ll have to wait for part two, but I don’t think you’ll be surprised at how I amp up the Situation. “Hookers and blow”? No, more like “Black Lotus and slave girls”. This is Swords & Sorcery! I have to admit my eyes glazed over a bit while reading that thread, because I know so little about RQ or Glorantha, but I thought your advice was sound. One thing that’s interesting is that although a lot is made of the difference between “sandbox” gaming and “adventure” gaming, is how much they have in common. As you pointed out on Story Games, it’s a continuum. On the one hand, you’ve got the sandbox ideal of a world that is generated and operates independently of the players, but then as the sandbox gets played in, the stuff the DM has to prep starts becoming more and more a response to player activity, so that very quickly it can start to look like a game like Burning Wheel, where players explicitly tell the GM what the adventure is going to be about. I think a lot about Mouse Guard being a sort of middle ground. 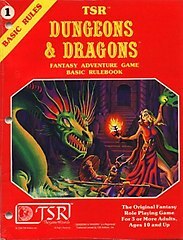 You’ve got this clearly defined setting that everyone is agreeing to before they sit down to play, which has a lot in common with traditional D&D (“you play Conan, I’ll play Gandalf, we kill Dracula!”). But then you’ve got the Story Games flags telling the GM what you want to do in the game (“I want to prove myself! Yeah and I hate weasels!”). The actual good part of that thread is epweissengruber’s posts, not mine. Everything else is pretty much extraneous.